Everything was handled so efficiently and smoothly throughout the length of the tour. Nancy and Jose work together and complement each other in all ways. So many positive memories come to the surface as I look back on that experience. Most memorable are the hikes themselves, the picnic lunches and evening dinners and the knowledge shared along the way. There were hikes in meadows winding around lakes and climbing hillsides where the tinkling of cowbells and the splashes of wildflower colors are vivid memories. There was a hike through the Cares River gorge, a spectacular natural wonder stretching seven miles long with towering peaks above and a deep riverbed below. The much anticipated event of the day was the picnic lunch which Jose backpacked in for us and carefully presented while awaiting ou arrival. There were always many varieties of delicacies including local cheeses, breads, green and black olives, petite corn cobs, white asparagus spears, carrots, tomatoes, etc. All the accommodations were very comfortable and well chosen for introducing us to inns in both the rural settings and larger towns with the Picos region. In every way Nancy and Jose proved themselves to be expert guides and tour planners. Mostly their love of what they are doing shines through and makes for a most personable and delightful experience. I had a wonderful time. "Nancy & Jose. It has been a real pleasure to enjoy this very planned and carefully thought out adventure. You are a delightful couple, and your enthusiasm was much appreciated. It goes without saying that Jose`s picnic spots and menu were delightful. Your prompt responses to email and keeping me updated in preparation of this trip were exemplary. Nancy, your knowledge of Galicia is more than what I would expect a Galician to have. I enjoyed all meals, bar none. Starting and ending the tour in this fantastic hotel [5-star Reyes Catolicos in Santiago de Compostela] is a great idea. Your tour is the BEST and I wish you great success in your future endeavors....I think your set up is so far above all other 'commercial' tours that the best thing you can do, is, not to change much. Hope to join you on one of your future trips." "An awesome experience in the real meaning of the word....You`ve opened a big door. Superb!...Excellent organization. Very well planned and balanced....Have re-read your book and enjoyed so much knowing the places mentioned; this time, too, could feel with the pilgrims as they described their expectations and discoveries." "Nancy & Jose could not have been more knowledgable or better prepared. The organization and pace of the schedule were outstanding...The operation was smooth but extremely flexible...The picnics were one of the highlights of the day. We appreciated our exposure to a variety of regional foods and the kind attention to our likes and dislikes. We loved the restaurants that you selected and would recommend every place that you chose. It was obvious that you took great care to expose us to many regional foods in different settings...This 'Camino' experience was one that we`ll never forget. The knowledge, kind attention, warmth, good humor and sensitivity of our guides will long be remembered. Our group was so compatible that we hate to see it end...Thanks for creating a fabulous memory! What a rewarding experience. p.s. will highly recommend the trip to our friends!!" "I find it remarkable how individuals can bond in such a short time!....The two of you add a special something that made the trip truly unique and memorable. I so appreciated your dedication to my total satisfaction. Thank you for being who you are." "Thanks again so much for everything. I`ve decided that the one-word description of the trip is 'magical'....Your knowledge was absolutely excellent. I can`t imagine traveling with people more knowledgeable about an area, or more willing and able to share their knowledge....Organization was perfect....Part of the perfection is a measure of flexibility that allows small changes to be made easily in the face of unexpected circumstances....The meals were wonderful. The food was invariably delicious and representative of local cuisine....Every restaurant provided new information about local culture and local dishes. I`m going to try and learn to cook Spanish food at home!....I can`t imagine how the tour could have been better, and I feel lucky to have participated in it. Every detail reflected thoughtful advance planning, and I felt your concern about us having a good time, and seeing what we wanted to see, during virtually every hour that passed, but always in a pleasant, low key fashion. Thanks to you both." "The walking was great; each section so different it`s hard to pick a favorite. Loved the uphill climb, meseta, wildflowers, greenery in Navarre and Galicia. Walk into Estella beautiful!... I felt like I was with the experts! It far surpassed my expectations... The organization could not have been better. Well paced for all levels....Can`t wait to come back. Hope to count you both as friends." "Your information to me was superb!....Jose & Nancy, both of you complimented each other so, so well. Because of you, I know more about the history, the geology, the flora and the 'cows'. The church history and the legends about Santiago were inspiring for the non-religious me....Your organizational skills are outstanding. If I were the CEO of a corporation, I would try to hire you, both, immediately! The timing of everything was great. You gave us space when we needed it....Great food; the variety of breads and cheeses with the regular fare of tomatoes, baby corn, varieties of olives and peppers was perfect....I never have experienced such individual attention on any trip. The totality of the journey - and that includes the wonderment of Galicia, the interpersonal relationships among all included, the physical exerting, the eating, savoring, drinking of such special wines - exceeded my expectations in every way!" "One of the best trips I`ve ever taken (that`s not an exaggeration!). You were both fabulous - your knowledge, enthusiasm, and attention to detail resulted in a very special experience. Best wishes for much continued success!" "You have spoiled us! It will be hard to find a tour experience like this again (except with you!). Your (both of you) commitment to quality - enhancing every facet, being patient with us, introducing us to such exceptional places - was great and we are both quite conscious of it....Thank you both for a great experience." Bernie and I think and talk often about our Galician adventure. When we tell our friends about it (as much as they can stand!) we run out of superlatives. As you know, we took a bunch of pictures--a few are good and we`re still enjoy looking through them. We so appreciated your efforts--from the larger scheme of the trip to the smaller details!...Please keep us posted on interesting developments!" "I`m extremely impressed with your experience, your website and the sights/subjects of your tour. I was even more impressed when I compared your prices to other similar European tours and found yours to be very reasonable. Your website is excellent, very easy to find through several good links, and very professional. I also thank you for your immediate reply to my inquiries and your kind words!" After returning from her trip to Galicia, a participant wrote the following letter about her journey and sent it to her family and friends. "On Foot In Spain. www.onfootinspain.com. We saw the ad in the New York Sunday Times, logged on and signed on all in one day - propelled by some unbridled impulse that said DO IT! -Nine days in a foreign land. -A bit of history. -Good eating. -Good exercise. -Sounded ... good. Little did we know we were about to step into another arena in space and time and pleasure. Unspoiled. Pastoral. Breathtakingly beautiful. Isolated from the rest of Spain by ocean, rivers and mountains, Galicia is a world into itself. Even its language, Gallego, sets it apart. Testimonials to its impressive history are evident throughout the region, from the ruins of circular settlements called castros dating to the 6th century BC and still functioning Roman churches, to the perpetual portrayals of its beloved St. James, whose remains were alleged to have been discovered in the 9th century at the site that became Santiago de Compostela. Medieval dwellings are still inhabited. Cowherds continue to pursue their flocks with stick-in-hand. Fishermen carry on traditions set by their great, great grandfathers. Women scrub clothes at washing wells and bake bread in centuries old communal ovens. We watched roofs being thatched and girls being taught how to make bobbin-lace. -And we listened to the favorite musical instrument of the area, dating back to invasions by the Celts, the bagpipe. On Foot In Spain is the brainchild of a couple who share in common a passion for Northern Spain. Jose, a lawyer turned teacher / writer / carpenter / tour guide is a native of Santiago de Compostela. Nancy is a cultural anthropologist from California who has spent the past eight years studying, writing and lecturing on Galicia and El Camino. Their combined knowledge of the area`s history, geography, anthropology, culture, architecture, art, flora, fauna, food, wine, music and folklore is boundless. Avid hikers, they have combed the countryside`s trails, recording detailed descriptions in the Lonely Planet`s Walking In Spain. Their tour objective is to encompass the best of the above. 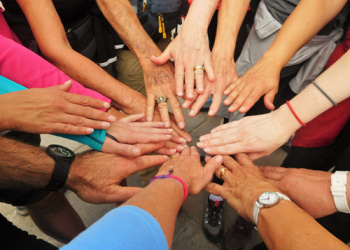 This was our first tour, but I would imagine in any group that is bound together through travel, one`s level of enjoyment is as contingent upon interpersonal dynamics as it is upon sites beheld. From the first meeting, the synergy among us was up-beat, smooth and amiable - with an immediate sense of camaraderie. Not one to sleep on airplanes, I crossed the Atlantic reading Nancy`s Pilgrim Stories: On and Off the Road to Santiago, intrigued that her published dissertation concerned pilgrimage, a topic that has held my interest for years. From the personal content in her book to her easy and informative rapport in the planning of our trip, it was not surprising that Tony`s most consistent adjective for Nancy was "sparkles". Without exaggeration, she and Jose are a physically beautiful couple, charged with enthusiasm, and organized to a T. Breakfasts concluded with map handouts - to be followed throughout the day by commentary on all aspects of interest. We traveled comfortably in a blue mini van in which, among all else there was a library of books of the region! Their policy of BEST meant our lodgings (all with private bath) stretched from the exquisite five star Hotel Reyes Catolicos in Santiago and a lighthouse in Finisterre, to the slate-roofed Casa Carlos in a tiny mountain hamlet called Vilamor. All meals were provided, with emphasis on traditional fare. At this point I am about to run the risk of overdoing my superlatives, but the food truly was among the highlights of the trip. -Fresh. -Simply prepared. -Extraordinarily tasty. -Always accompanied by home-made wines. We ate what the local people eat ... and the local people in Galicia enjoy what must be some of the finest eating in the world. Dinners by the sea consisted of seafood salad appetizers followed by the catch of the day (grilled, fried, or as a caldeirada casserole) plus a selection of octopus (pulpo - the specialty of Galicia), squid, shellfish, fresh vegetables and potatoes. All were commonly served with refrito, an olive oil, garlic and paprika sauce. Mountain dinners began with Caldo Galego (soup), then Spanish tortillas (omelets of eggs, potatoes and onion), grilled or stewed beef, pork, chicken or lamb, green salads and French fries. Flan or Pastel Santiago (an almond cake) concluded every meal ... when there was room. -And then, the lunches! -In a minute. First, the foot portion of On Foot In Spain! The days. The hikes. The point, in essence, of the journey. "Medium" level difficulty, said the www site: "Six to twelve miles a day on rolling hills and mixed trails with an occasional steep ascent". Tony goes on extended hiking trips every year with his buddies. He was tested. I was not. For all of our daily walking, I knew better than to ponder my hiking aptitude to any extent for fear of talking myself out of the trip. I admit, however, to sometimes amusing, sometimes horrific visions of myself gasping for breath, toiling behind in sweaty despair. Our first hike was one of the most difficult, the ascent of A Moa in the seaside mountain range called the Celtic Olympus. -And it was wonderful, with lush vegetation giving way to mountain meadows, rock formations, the sighting of wild horses - all in cool mist. -Not to mention the first of Jose`s lunches! To our light day-packs, Jose`s burden was gravity defying. Every day he produced a fresh loaf of pan (hogaza bread), a local cheese (Tetilla, Arzua, San Simon and Cabreiro - my favorite) and an assortment of olives (such as salmon filled), roasted red peppers, jamon serrano (lean ham), green or white asparagus, fresh tomatoes, ajeta (pickled garlic sprouts), baby corn, tuna or cod empanadas, pate a la pimienta, pate a la jamon, a variety of chorizos (Fuet, Salchichon, Iberico) and replenishment for our water bottles. All of this he carried with ease, racing on ahead so that our arrival at the lunch spot would be greeted by a magnificent spread! Yes, happily, I could do it. -The hiking that is. The most difficult part of every day was the first half hour of incline as my lungs adjusted to the increased demand for oxygen. The feeling of competence that ensued, however, is beyond description. It bears mentioning with admiration that Karen Patterson soared at Jose`s heels for most of the trip! The following three days were one extended walk along the Costa da Morte, returning each morning to where we had left off. The lone sandy beach deceptively featured on summertime travel posters is a reality here. -Beach after glorious beach. We hiked for miles along seaside trails with one outstanding view after the next, almost never encountering another individual. Consistent througout the trip, Nancy would periodically pause to point to a particular indigenous flower or a rock that looked like a bear, or she would describe the "Death Coast`s" heart wrenching history and tell stories about the light houses and fishing villages along the way. In the afternoons and evenings we visited monastic ruins, local museums and lace makers, and watched the fishing boats return to port, overflowing with their catch. Our day of transition to the mountains started with the third leg of the coastal hike. En route to Piornedo we toured the 'medieval' river port of Betanzos and then walked the circumference of the fortified city of Lugo on its second century Roman wall. If the seaside fishing villages had been isolated, the mountain pueblos were back-of-beyond, accessed only by a narrow, winding single-laned road with steep drop-offs. One could not help but equate this near impenetrable land of tiny hamlets to a Spanish Brigadoon, complete with the violet hue of heather blossoming on the hillsides! Upon one turn in the road Jose pointed to the highest point in the Serra Dos Ancares, O Mostallar, the 6437' peak that we were scheduled to ascend the following day. Gasp! It too, perhaps it most of all, turned out to be a personal high in every meaning of the word. Before the trip was to end we would drive to another mountain range, the Serra do Courel, climb a mountain devesa, a "type of forest unique to Spain with more than 1000 species (both flora and fauna)", and drink from its side-by-side lime and iron based springs famed for their healing qualities (Fonte Do Cervo). The final day began by following the Rio Lor (by foot) from hamlet to hamlet along nine miles of ancient trails, and concluded with Santiago`s most elegant restaurant back at the Hotel Reyes Catolicos. Over dinner every night Nancy would ask each of us our highlights of the day. I now ask myself, the highlights of the trip? Hard. The affinity of the group. We traveled as one body. There was no discord nor imbalance. The guides, Nancy and Jose, were superb. Our times of exchange were often profound. Moments within our own thoughts were respected. Quite simply, the glory of Galicia! It is impossible to distinguish a spot or an occasion as better than the rest. My two most memorable sites while hiking were the descent over meadows, cliffs and dunes to the spectacular Traba Beach, and the panoramic ridge walk on Pico de Lagos in the Ancares Range. The fact that nine days away felt like nine weeks! We returned recharged and enriched - our outlook on life broadened."